From the Department of Medicine and Therapeutics, The Prince of Wales Hospital, The Chinese University of Hong Kong; Department of Medicine, Pamela Youde Nethersole Eastern Hospital; Department of Medicine, North District Hospital; Department of Medicine, Princess Margaret Hospital; Department of Medicine, Tseung Kwan O Hospital; Department of Medicine and Geriatrics, Taipo Hospital; and Department of Medicine, Queen Elizabeth Hospital, Hong Kong, China. Objective. To determine the efficacy of methotrexate (MTX) with infliximab (IFX) compared with MTX alone in the prevention of atherosclerosis and arterial stiffness in patients with early rheumatoid arthritis (RA). Methods. A randomized, open-label study in which early RA patients with active disease were treated with MTX alone (n = 20) and MTX plus IFX (n = 20) for 6 months. Patients were assessed every 3 months. Patients from the MTX-alone group who failed to achieve 28-joint Disease Activity Score remission (DAS28 ≤ 2.6) at 6 months were permitted to escape to open-label IFX. Intima-media thickness (IMT), pulse wave velocity (PWV), and augmentation index (AIx) were measured at baseline, 6 months, and 12 months. Results. At 6 months, there was a significantly greater reduction in PWV in the MTX-alone group (0.18 ± 1.59 m/s) compared with the MTX plus IFX group (−0.78 ± 1.13 m/s; p = 0.044), accompanied by significantly greater reduction in patient’s global assessment, number of swollen joints, C-reactive protein, and DAS28 in the MTX plus IFX group compared to the MTX-alone group. The changes in IMT and AIx were similar between the 2 groups. At 12 months, there was a trend favoring early combination treatment with regard to the reduction in PWV (p = 0.06). Conclusion. MTX plus IFX causes a more significant reduction in PWV than MTX alone in patients with early RA after 6-month treatment, and further improvement may be achieved in patients who continued on longterm tumor necrosis factor-α blockers, suggesting that early, effective suppression of inflammation may prevent progression of atherosclerosis by improving vascular function. Patients with rheumatoid arthritis (RA) die prematurely compared with the general population1, primarily because of cardiovascular (CV) disease1,2. Evidence suggests that this phenomenon also occurs in patients with early RA3,4,5. Chronic inflammation is probably a driving force for premature atherosclerosis in RA6. One study suggested that the pathogenic processes of atherosclerosis may be in place even before a diagnosis of RA7. Evidence of subclinical atherosclerosis including increased intima-media thickness (IMT), carotid atherosclerotic plaque, and arterial stiffness has been observed in RA patients with recent disease onset in some8,9,10,11,12 but not all studies13,14,15, suggesting that the accelerated atherogenic process related to inflammation may precede symptom onset. Data from observational studies have demonstrated that anti-tumor necrosis factor (TNF) therapy may decrease the risk of new CV events16,17, thus potentially reducing overall mortality. On the other hand, no significant association between exposure to anti-TNF treatment and the risk of experiencing a first acute coronary syndrome was observed in patients who received TNF inhibitor therapy within the first few years following the diagnosis of RA18. The use of surrogate endpoints instead of actual CV events may provide more evidence on whether patients with RA may benefit from potent antiinflammatory treatment such as anti-TNF therapy for the prevention of premature atherosclerosis. Data are inconsistent from observational studies regarding the effects of TNF blockers on atherosclerosis and arterial stiffness in patients with established RA19. The posthoc analysis of the first randomized controlled study (RCT) showed that pulse wave velocity (PWV) improved in patients with RA after treatment with infliximab (IFX) for 56 weeks20. However, the placebo-controlled part of the study was unable to assess vascular effects of IFX because of early drop-out of the placebo group. Another recent RCT demonstrated that biologics monotherapy improved arterial stiffness in patients taking methotrexate (MTX) or biologically naive patients with early RA21. However, whether disease-modifying antirheumatic drugs (DMARD) alone may result in a similar degree of change remained uncertain. Data from the BeSt study have demonstrated that initial combination therapy with MTX and IFX seemed to provide earlier clinical improvement and less progression of joint damage compared to step-up combination therapy22. Whether early control of inflammation using combination therapy with MTX and IFX results in less progression of vascular damage compared to delayed IFX treatment in the long term would also be of interest. We first compared the efficacy of MTX with and without IFX in improving IMT and arterial stiffness in patients with early RA over a period of 24 weeks. Second, we assessed the differences in the progression of atherosclerosis and vascular stiffness over a period of 1 year between patients who received early versus delayed IFX treatment. This was a prospective, randomized, open-label, single-center pilot study. Patients were age 18 years or older, with a diagnosis of active RA as defined by the American College of Rheumatology 1987 revised criteria23, and a disease duration not less than 2 years. This included patients with at least 4 swollen and tender joints, 28-joint Disease Activity Score24 C-reactive protein (DAS28/CRP) > 3.2, and either erythrocyte sedimentation rate (ESR) ≥ 28 mm/h or CRP ≥ 10 mg/l. Patients were ineligible if they had contraindications to treatment with MTX or IFX. Patients were also ineligible if they had a history of overt CV diseases or if they had been treated with aspirin, angiotensin-converting enzyme inhibitors, statins, or prednisolone > 10 mg daily, or had previous treatment with IFX or other biological agents. Forty patients with early RA were recruited. Patients were examined clinically at Weeks 0, 2, 6, and every 8 weeks thereafter until the end of the study, which included clinical examination and laboratory tests. Carotid ultrasound, PWV, and pulse wave analysis (PWA) were performed at baseline, 6 months, and 12 months. The Clinical Research Ethics Committee of the Chinese University of Hong Kong approved the study protocol, and informed consent was obtained from all patients. The 40 patients were randomly assigned to receive either MTX alone (n = 20) or combination IFX plus MTX (n = 20). All patients were interviewed and examined with the use of standardized data collection instruments. At baseline, we quantified extent of disease by recording extraarticular manifestations; previous treatment was recorded by patient interview and chart review. Other data including smoking habits and medical history were noted. DAS28 was determined at each visit, and patients were asked to fill in the Health Assessment Questionnaire (HAQ)25. Anthropomorphic measurements include height and weight, 2 consecutive blood pressure (BP) readings in sitting position, and heart rate. Adjustment of treatment was made according to the protocol below if patients could not achieve remission (defined as DAS28 ≤ 2.6). For both groups, MTX was started at a dose of 7.5 mg/week and gradually titrated up to 15 mg/week by Week 4 (increment of 2.5 mg/wk) and maintained at the same dose until the end of the study. If remission was not achieved by Week 14, the MTX dose was increased gradually to 20 mg/week by Week 20. Patients in the IFX + MTX group received IFX 3 mg/kg at Weeks 0, 2, 6, and every 8 weeks thereafter. For patients who did not achieve remission, IFX was increased to 5 mg/kg by Week 22 and 10 mg/kg by Week 38 until the end of the study. Patients in the MTX-alone group who failed to achieve remission by Week 22 were allowed to receive IFX 3 mg/kg at Weeks 24, 26, 30, and every 8 weeks thereafter. At Week 38, the dosage of IFX was increased to 5 mg/kg and then 10 mg/kg by Week 46 if remission was not achieved. These tests were done every 3 months: complete blood count, liver and renal function, ESR, CRP, fasting blood glucose, and lipid profile (total cholesterol, low-density lipoprotein cholesterol, high-density lipoprotein cholesterol, and triglycerides). Carotid IMT was measured using a high-resolution B-mode ultrasound machine (iE33, Philips). Briefly, duplex carotid ultrasound was performed by an experienced cardiologist (QS) using an 11-MHz linear vascular probe. IMT was measured offline in the distal common carotid artery (the arterial segment 1 cm proximal to the carotid bulb), bulb, and proximal internal carotid artery (the arterial segment 1 cm distal to the carotid bifurcation) using dedicated software (QLab 6.0, Philips), and was analyzed by the same investigator, who was blinded to all clinical information. The mean IMT values of 6 arterial segments were measured, the mean and maximum of which were calculated for further analysis. Our study involved a single ultrasonographer and a single reader. The intraclass correlation coefficient (ICC) for the mean of the 12 site-specific maximum IMT values was 0.9726. Participants had PWA in the morning, having fasted overnight, and were asked to avoid tobacco, alcohol, and caffeine 3 h before measurement, as reported27. Participants rested in a sitting position in a quiet room for at least 10 min before examination. BP was measured 3 times at the right brachial artery using a validated oscillometric device (Omron HEM-757). PWA was performed using the SphygmoCor device (SCOR2000 v. 7.01, AtCor Medical Pty. Ltd.) with a tonometer probe at the right radial artery. The central aortic arterial pulse wave was transferred from the peripheral arterial pulse wave automatically. Because augmentation index (AIx) in an individual patient varies by heart rate, it is commonly standardized to a heart rate of 75 beats/min. Brachial-ankle pulse wave velocity (baPWV) was assessed non-invasively in subjects in the supine position by a dedicated tonometry system (Non-Invasive Vascular Profile Device VP-2000; Omron Healthcare Inc.) as described28. The machine measured and recorded results of electrocardiogram, phonocardiogram, and BP of limbs as well as pulse waveforms of limb arteries automatically. The difference in the times of the start of the pulse waves was corrected for distance to obtain the baPWV. All PWA measurements were made by a single skilled operator. Intraobserver reliability ICC was 0.86. The method of concealed random allocation was used. Simple randomization was conducted by a computer-generated random list. The primary outcomes were the progression of subclinical atherosclerosis and arterial stiffness markers, as evaluated by IMT, AIx, and PWV over a period of 6 months. Per-protocol analysis was performed to assess whether there were any differences in the progression of atherosclerosis and vascular stiffness between early and delayed IFX treatment. The MTX ± delayed IFX group (n = 19) consisted of 5 patients who received 1 year of MTX and 14 patients who received escape therapy from Week 24 to Week 46. 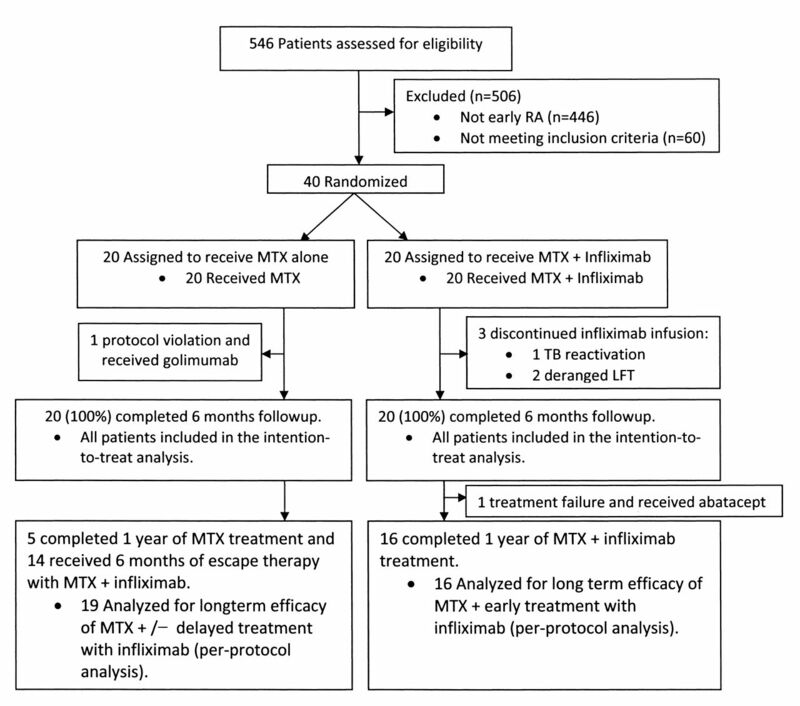 The MTX + early IFX group (n = 16) consisted of patients who received 1 year of combination therapy (Figure 1). Secondary atherosclerosis outcomes included reduction in progression of IMT, AIx, and PWV over 12 months. Study participants and progress of the study. TB: tuberculosis; LFT: liver function tests. Results are expressed as mean ± SD for normally distributed data. Non-normally distributed data are expressed as median (inter-quartile range). Student’s t test or Mann-Whitney U test were used to compare continuous variables between groups. The chi-squared test or Fisher’s exact tests were used to compare categorical variables between groups. Data at 6 months were analyzed according to the intention-to-treat (ITT) principle in all individuals with at least 1 additional visit after the baseline. Missing data at the end of the study were accounted for using last observation carried forward. The longitudinal effects of early IFX therapy (Group B) compared to delayed IFX therapy (Group A) on various clinical and laboratory assessments and subclinical atherosclerosis and arterial stiffness markers during the 12-month followup period were examined as the interaction between the therapy group and time using repeated-measure ANOVA. A minimal level of significance of p < 0.05 was used. All tests were 2-tailed. All statistical analyses were conducted using SPSS 15.0 for Windows. The sample size is estimated by the Power Analysis and Sample Size for Windows software (PASS 2000, NCSS). Based on a previous study in patients with psoriatic arthritis, the rate of change in the mean IMT was −0.0137 mm/year (SD 0.02916, 95% CI −0.0381 to 0.0106) and 0.0129 mm/year (SD 0.02743, 95% CI 0.0001 to 0.0257) in the TNF-α blocker-treated (n = 9) and TNF-α-naive group (n = 20), respectively29. Sample size of 18 per arm would achieve 80% power to detect a difference between the groups at a significance level (α) of 0.05 using a 2-sided Student’s t test. Allowing a 10% dropoff, a total sample size of 40 would be needed. The baseline demographic, clinical and treatment variables, and cardiovascular risk factors and vascular assessments are summarized in Tables 1 and 2. All these variables were similar between the 2 groups except disease activity, which was significantly higher in the MTX + IFX group compared with the MTX-alone group (Table 2). Baseline demographic and clinical characteristics of the patients with early rheumatoid arthritis. Data are mean ± SD or median (interquartile range) unless otherwise specified. Intention-to-treat analysis: changes in disease activity indices, markers of inflammation and cardiovascular risk factors over 6 months. Data are mean ± SD or median (interquartile range). At 6 months, 1/20 subjects (5%) in the MTX-alone group had received golimumab because of inefficacy, while 3/20 (15%) in the MTX + IFX group required discontinuation of MTX and IFX because of adverse events (for 1, reactivation of latent tuberculosis infection, and for 2, increase in liver enzymes; Figure 1). None of the patients changed dosage or type of antihypertensive or received lipid-lowering medication throughout the study period. At 6 months, 5/20 (25%) and 9/20 (45%) patients achieved remission in the MTX-alone group and the MTX + IFX group, respectively (p > 0.05). 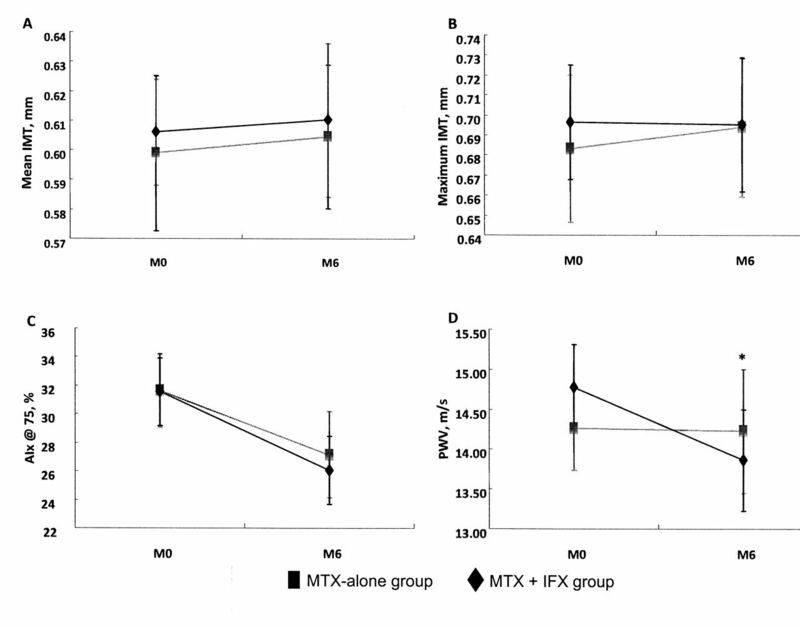 The reductions of the disease activity and inflammatory markers were significantly greater in the MTX + IFX group compared with the MTX-alone group (Table 2). The markers were patient’s global assessment (PtGA; p = 0.006), number of swollen joints (SJC; p = 0.042), DAS28 (p = 0.01), and CRP (p = 0.007). MTX plus IFX showed superior efficacy to MTX alone regarding the change in PWV after 6 months (0.18 ± 1.59 m/s in the MTX-alone group vs −0.78 ± 1.13 m/s in the MTX + IFX group; p = 0.044; Figure 2). No significant changes in IMT and AIx were observed in the 2 groups. Changes in PWV in patients randomized to receive MTX + IFX who did (n = 9, −0.87 ± 1.40 m/s) or did not achieve DAS remission (n = 11, −0.69 ± 0.87 mm/s; p = 0.746) were similar. There were no significant between–group differences in the changes in all the CV risk factors, including BP (Table 2). Moreover, the changes in PWV of the 40 patients did not correlate with the change in systolic BP (SBP; r = −0.042, p = 0.807) or diastolic BP (DBP; r = 0.103, p = 0.550). Intention-to-treat analyses: changes in (A) mean intima-media thickness (IMT); (B) maximum IMT; (C) augmentation index standardized to a heart rate of 75 bpm (AIx@75); and (D) pulse wave velocity (PWV) at baseline (M0) and month 6 (M6). Data are presented as the mean (standard error of mean) for each visit. Methotrexate (MTX)-alone group (gray line, rectangle) consisted of 20 patients randomized to receive 1 year of MTX. MTX + infliximab (IFX) group (black line, diamond) consisted of 20 patients randomized to receive 1 year of combination therapy with MTX and IFX. *p < 0.05 comparison between the changes from baseline between the 2 groups. After 6 months, 1 more patient from the MTX + early IFX group dropped out because of inefficacy (Figure 1). For those who completed the protocol, 11/19 (58%) and 8/16 (50%) patients achieved remission in the MTX ± delayed IFX group and the MTX + early IFX group, respectively, at 12 months. In the repeated-measure ANOVA, the MTX + early IFX group [5.0 (IQR 5.0, 6.0) at baseline, 1.0 (IQR 0, 2.0) at 6 months, and 0 (IQR 0, 2.8) at 12 months] had a significantly better improvement in the SJC over time than the MTX ± delayed IFX group [5.0 (IQR 4.0, 7.0) at baseline, 3.0 (IQR 1.0, 4.0) at 6 months, and 0 (IQR 0, 2.0) at 12 months; p = 0.031]. Apart from that, there were no significant differences in the change in other disease activity and inflammatory markers between the 2 groups (data not shown). At 12 months, there were no significant differences between the 2 groups in the changes in atherosclerosis measures (Table 3), although there may be a trend favoring early combination treatment with regard to the reduction in PWV (p = 0.060). There was a nonsignificant increase in the PWV over 12 months in the MTX ± delayed IFX group, mainly due to the increase in PWV in the 5 patients who received 1 year of MTX (baseline: 13.04 ± 2.83 m/s; 12 months: 14.29 ± 4.26 m/s), while PWV remained stable for those 14 patients who received MTX + delayed IFX (baseline: 14.43 ± 2.17 m/s; 12 months: 14.43 ± 3.34 m/s). Further, there were no significant between-group differences in the changes over time in the CV risk factors (data not shown). Similar to the intention-to-treat analysis, the changes in PWV of the 35 patients did not correlate with the change in SBP (r = −0.271, p = 0.127) or DBP (r = 0.246, p = 0.179). Per-protocol analysis: changes in vascular measures over 12 months. Data expressed in mean ± SD. Methotrexate (MTX) ± delayed infliximab (IFX) group consisted of 5 patients who received 1 year of MTX and 14 patients who received escape therapy with MTX and IFX from Week 24 to Week 46. MTX + early IFX group consisted of 16 patients who received 1 year of combination therapy with MTX and IFX. To our knowledge, this is the first RCT comparing the vascular effect of MTX plus IFX with MTX alone in patients with early RA. We confirmed that 6 months’ treatment of MTX plus IFX was superior to MTX alone in improving arterial stiffness in early RA patients with active disease, as evidenced by a significantly greater reduction in PWV, independent of the CV risk factors. This change was associated with a significantly greater extent of improvement in the clinical (PtGA, SJC, DAS28) and laboratory indicators of inflammation (CRP), suggesting that effective control of inflammation by IFX may prevent progression of atherosclerosis by improving arterial function. The changes in PWV were similar in patients randomized to receive MTX plus IFX regardless of whether DAS remission was achieved. Nonetheless, the results are difficult to interpret because of the small sample size. Our results were consistent with a recent RCT comparing the effect of various biologics monotherapies using PWV adjusted for BP (cardio-ankle vascular index)21, and other observational or nonrandomized controlled studies30,31. Inflammation leads to the activation of endothelial cells, which, through an increase in the expression of leukocyte adhesion molecules, promotes a proatherosclerotic environment32. Endothelial dysfunction may affect arterial stiffness through nitric oxide (NO), which is important in arterial stiffness regulation33. Inflammatory cytokines may also act through upregulation of angiotensin type 1 receptors to cause vasoconstriction and hypertension34. Further, an injury to the endothelium can proceed to intimal thickening with a decrease in vascular wall contractile elements, as smooth muscle cells migrate to the intima, multiply, and lay down the extracellular matrix. The resultant arterial stiffening is characterized by increased vascular collagen formation, calcification, and breakdown of elastin35. Our study also provides prelimin ary evidence that effective control of inflammation by early IFX treatment may be associated with greater improvement of the PWV at 1 year compared to those whose treatments were delayed by 6 months. This improvement occurs most likely because sustained reduction in PWV was possible in patients who continued on longterm IFX, accompanied by a sustained improvement in the clinical markers of inflammation (as reflected by a significantly better improvement in the SJC in the early treatment group compared to the delayed treatment group), independent of the CV risk factors. Apart from suppression of inflammation, other mechanisms whereby IFX may improve arterial stiffness may include preventing endothelial dysfunction through a decrease in the production of cytotoxic concentrations of NO36, or by preventing injury to the endothelium and thereby inhibiting perivascular leukocyte infiltration and subsequent vascular smooth muscle cell proliferation37. Further studies are required to assess whether IFX reduces arterial stiffening by means of downregulating angiotensin type 1 receptors to cause vasodilation, and to assess whether IFX reduces arterial stiffening by preventing vascular collagen formation, calcification, and breakdown of elastin. Arterial stiffness is increasingly recognized as a surrogate endpoint for CV disease and is associated with the presence of CV risk factors and atherosclerotic diseases35. Arterial stiffness can be measured with noninvasive, reproducible, and relatively inexpensive techniques suitable for large-scale studies. Carotid-femoral pulse wave velocity (cfPWV) is considered the gold standard for assessing aortic stiffness38 and predicts future CV events and all-cause mortality in a strong and independent manner38a. Brachial-ankle PWV, calculated as the ratio of the distance between the brachial and the tibial artery divided by the transit time between these 2 arteries, has been proposed as an additional arterial biomarker of CV risk. Use of this index has been popularized primarily in East Asian countries over the past 13 years and has been shown in cross-sectional comparisons to be associated with CV risk factors and function, as well as CV disease, similarly to cfPWV40. The observed difference of 1 m/s in the group that received 1 year of MTX + IFX was remarkable, because a metaanalysis39 showed that an increase in baPWV by 1 m/s corresponded with an increase of 12%, 13%, and 6% in total CV events, CV mortality, and all-cause mortality, respectively. We did not find any differences in the changes in AIx after 6 months of MTX with or without IFX therapy in the ITT analysis, or between early and delayed IFX treatment at 12 months in the per-protocol analysis. Apart from a cohort study that reported that treatment with etanercept reduced AIx41, the majority of previous studies did not report any change in AIx after TNF-α antagonists20,42,43,44. AIx is a composite measure dependent on the magnitude and site of pulse wave reflection in addition to the speed of the reflected wave. Central arterial stiffness (PWV) and peripheral reflectance are important determinants of the AIx. Therefore, not only macrovascular functions, but also microvascular functions affect the AIx. Results from our study as well as others may suggest that PWV may be a more sensitive marker reflecting improvement of predominantly macrovascular functions in patients receiving TNF blockers. Further, normalization of peripheral vasculature tonus and an increase in wave reflection may also occur after initiation of anti-TNF-α therapy. Similarly to AIx, no differences were noticed regarding the changes in IMT after 6 months of MTX with or without IFX therapy in the ITT analysis, or early compared to delayed IFX therapy in the per-protocol analysis. Our results concurred with previous reports that the IMT did not change significantly after 12 to 18 months of treatment with a TNF-α blocker20,45. Progression of IMT has been described in 8 patients with longstanding RA who had maintained a high disease activity despite at least 2-year treatment with IFX46. In contrast, 2 other reports demonstrated IMT reduction in patients with RA47,48. Evaluation of the regression of subclinical atherosclerosis by carotid arterial ultrasound examination following treatment of risk factors takes time (i.e., more than 1 year is required in most cases to confirm such regression). Longer-term studies may be required to clarify this issue. Results from our study also suggest that these commonly used “surrogate” markers of atherosclerotic vascular disease are not necessarily interchangeable and that PWV may be more responsive to change over a short period of time than IMT. The strength of our study was the randomized, controlled design and the inclusion of patients with short disease duration in whom changes in the vessel wall may reflect current (but reversible) inflammation rather than more permanent structural vessel changes. In Hong Kong, the cost of TNF inhibitors is not reimbursed by the government, but patients who fulfill the Hong Kong guidelines for the use of TNF blockers49 can apply for financial assistance, provided they meet certain income limits. As a result, most patients in Hong Kong treated with anti-TNF need to cover the medication costs themselves. Our study was considered ethical by the local ethics committee and was welcomed by patients because they all received free medications. Limitations of the trial included, first, the use of surrogate endpoints instead of actual CV events. There is virtually no data to suggest that such vascular assessments are good predictors of future CV events specifically in patients with RA. There is a single study suggesting this for IMT (n = 47)50, and another study by the del Rincon group suggesting that plaque is predictive51. Second, the sample size was small because this was only a pilot study to obtain preliminary evidence. Third, because we have included Chinese patients with short disease duration who are stable with moderate to severe disease activity, these results may not be generalizable to patients with RA who are from other ethnic backgrounds, have long disease duration, or have mild disease activity. Fourth, the lack of vascular outcome measures before 24 weeks means that we may have missed any earlier changes that may revert to baseline within the timeframe of assessment. Fifth, whether longer treatment duration may be required for the process of inflammation suppression on atherosclerotic disease progression in patients with RA remained uncertain. Lastly, the fluctuating disease activity during the course of our study may also contribute to the changes in the vascular assessment measures. These results demonstrate that 6 months of MTX and IFX therapy was superior to MTX alone in improving arterial stiffness in terms of PWV reduction in patients with early RA. Further, early treatment with IFX may be beneficial, because sustained improvement in the PWV may be achieved in patients who continued receiving IFX in association with improvement in clinical indices of inflammation, but independent of changes in metabolic and CV profiles, probably by lowering inflammatory mediators of atherosclerosis. EuroDiagnostica for the anticitrullinated protein antibody ELISA kits. Supported by an educational grant from Janssen Pharmaceutical (Hong Kong), which also provided the study drugs. Accepted for publication July 17, 2012. The mortality of rheumatoid arthritis. Arthritis Rheum 1994;37:481–94.
. Risk of cardiovascular mortality in patients with rheumatoid arthritis: A meta-analysis of observational studies. Arthritis Rheum 2008;59:1690–7.
. Mortality in early inflammatory polyarthritis: Cardiovascular mortality is increased in seropositive patients. Arthritis Rheum 2002;46:2010–9. Mortality in rheumatoid arthritis. Increased in the early course of disease, in ischaemic heart disease and in pulmonary fibrosis. Rheumatology 2007;46:350–7.
. High ten-year risk of cardiovascular disease in newly diagnosed rheumatoid arthritis patients: A population-based cohort study. Arthritis Rheum 2008;58:2268–74.
. A tale of two diseases: atherosclerosis and rheumatoid arthritis. Circulation 1999;100:2124–6.
. Systemic inflammation as a risk factor for atherothrombosis. Rheumatology 2008;47:3–7.
. Atherosclerotic disease is increased in recent-onset rheumatoid arthritis: A critical role for inflammation. Arthritis Res Ther 2007;9:R116. Early treatment reduces the cardiovascular risk factors in newly diagnosed rheumatoid arthritis patients. Semin Arthritis Rheum 2008;38:13–9.
. Association of anti-modified citrullinated vimentin with subclinical atherosclerosis in early rheumatoid arthritis compared with anti-cyclic citrullinated peptide. J Rheumatol 2011;38:828–34.
. Antibodies against oxidized low-density lipoprotein are associated with subclinical atherosclerosis in recent-onset rheumatoid arthritis. Clin Rheum 2010;29:1237–43. Non-invasive assessment of coronary flow reserve and ADMA levels: A case-control study of early rheumatoid arthritis patients. Rheumatology 2009;48:834–9. Atherosclerosis in early rheumatoid arthritis: Very early endothelial activation and rapid progression of intima media thickness. Arthritis Res Ther 2010;12:R158.
. Increased pulse wave velocity and shortened pulse wave propagation time in young patients with rheumatoid arthritis. Can J Cardiol 2004;20:1097–100. Increased augmentation index in rheumatoid arthritis and its relationship to coronary artery atherosclerosis. J Rheumatol 2007;34:2388–94. Treatment with tumor necrosis factor blockers is associated with a lower incidence of first cardiovascular events in patients with rheumatoid arthritis. J Rheumatol 2005;32:1213–8.
. Treatment with tumor necrosis factor inhibitors and the risk of acute coronary syndromes in early rheumatoid arthritis. Arthritis Rheum 2012;64:42–52.
. Vascular effects of biologic agents in RA and spondyloarthropathies. Nat Rev Rheumatol 2009;5:677–84. IFX improves vascular stiffness in patients with rheumatoid arthritis. Ann Rheum Dis 2009;68:1277–84.
. Tocilizumab monotherapy reduces arterial stiffness as effectively as etanercept or adalimumab monotherapy in rheumatoid arthritis: An open-label randomized controlled trial. J Rheumatol 2011;38:2169–71. Comparison of treatment strategies in early rheumatoid arthritis: A randomized trial. Ann Intern Med 2007;146:406–15.
. Validity of single variables and composite indices for measuring disease activity in rheumatoid arthritis. Ann Rheum Dis 1992;51:177–81.
. Toward a multidimensional Health Assessment Questionnaire (MDHAQ): Assessment of advanced activities of daily living and psychological status in the patient-friendly Health Assessment Questionnaire format. Arthritis Rheum 1999;42:2220–30. Subclinical carotid atherosclerosis in patients with psoriatic arthritis. Arthritis Rheum 2008;59:1322–31. Effects of rosuvastatin on subclinical atherosclerosis and arterial stiffness in rheumatoid arthritis: A randomized controlled pilot trial. Scand J Rheumatol 2011;40:411–21.
. Increased arterial stiffness correlated with disease activity in systemic lupus erythematosus. Lupus 2008;17:1096–102. Tumour necrosis factor alpha blockade is associated with sustained regression of carotid intima-media thickness for patients with active psoriatic arthritis: A 2-year pilot study. Ann Rheum Dis 2011;70:705–6.
. The effect of tumor necrosis factor-α antagonists on arterial stiffness in rheumatoid arthritis: A literature review. Semin Arthritis Rheum 2012;42:1–8.
. Effect of 1-year anti-TNF-alpha therapy on aortic stiffness, carotid atherosclerosis, and calprotectin in inflammatory arthropathies: A controlled study. Am J Hypertens 2012;25:644–50.
. The role of endothelial function and its assessment in rheumatoid arthritis. Nat Rev Rheumatol 2010;6:253–61.
. Inhibition of basal nitric oxide synthesis increases aortic augmentation index and pulse wave velocity in vivo. Br J Clin Pharmacol 2002;53:189–92. C-reactive protein upregulates angiotensin type 1 receptors in vascular smooth muscle. Circulation 2003;107:1783–90. Expert consensus document on arterial stiffness: Methodological issues and clinical applications. Eur Heart J 2006;27:2588–605. Short-term effect of anti-TNF-alpha therapy on nitric oxide production in patients with severe rheumatoid arthritis. Clin Exp Rheumatol 2009;27:452–8. Anti-tumor necrosis factor-alpha therapies attenuate adaptive arteriogenesis in the rabbit. Am J Physiol Heart Circ Physiol 2005;289:H1497–505. Expert consensus document on the measurement of aortic stiffness in daily practice using carotid-femoral pulse wave velocity. J Hypertens 2012;30:445–8.
. Prediction of cardiovascular events and all-cause mortality with brachial-ankle elasticity index: A systematic review and meta-analysis. Hypertension 2012;60:556–62.
. Prediction of cardiovascular events and all-cause mortality with arterial stiffness: A systematic review and meta-analysis. J Am Coll Cardiol 2010;55:1318–27. Comparison between carotid-femoral and brachial-ankle pulse wave velocity as measures of arterial stiffness. J Hypertens 2009;27:2022–7.
. Etanercept improves inflammation-associated arterial stiffness in rheumatoid arthritis. Rheumatology 2009;48:1418–23. Rheumatoid arthritis is associated with increased aortic pulse-wave velocity, which is reduced by anti-tumor necrosis factor-alpha therapy. Circulation 2006;114:1185–92.
. Tumour necrosis factor antagonists improve disease activity but not arterial stiffness in rheumatoid arthritis. Rheumatology 2005;44:1428–32.
. Tumor necrosis factor-alpha antagonists improve aortic stiffness in patients with inflammatory arthropathies: A controlled study. Hypertension 2010;55:333–8. Sustained improvement of vascular endothelial function during anti-TNF alpha treatment in rheumatoid arthritis patients. Scand J Rheumatol 2009;38:6–10.
. Effect of anti-tumor necrosis factor alpha therapy on the progression of subclinical atherosclerosis in severe rheumatoid arthritis. Arthritis Rheum 2006;55:150–3. Response to anti-tumour necrosis factor alpha blockade is associated with reduction of carotid intima-media thickness in patients with active rheumatoid arthritis. Rheumatology 2007;46:1111–5. Long-term anti-tumour necrosis factor therapy reverses the progression of carotid intima–media thickness in female patients with active rheumatoid arthritis. Rheumatol Int 2009;30:193–8.
. Carotid intima-media thickness predicts the development of cardiovascular events in patients with rheumatoid arthritis. Semin Arthritis Rheum 2009;38:366–71.
. Carotid atherosclerosis predicts incident acute coronary syndromes in rheumatoid arthritis. Arthritis Rheum 2011;63:1211–20.